Born Noah Nicholas Beery February 17, 1882, in Smithville, Missouri, his father, Noah W. Beery, a native of Smithville (near Kansas City), was, reportedly, of Swiss descent and worked as a police officer. His mother, Mary Margaret Fitzgerald, was from Ridgley, Missouri. Noah was the elder brother of the more famous of the acting Beery brothers, Wallace Beery. Another brother, William Beery, was also an actor of much less stature who later entered the oil business quite successfully. Noah grew up on a farm in western Missouri. Reportedly, he went to grade school in Kansas City with outlaw Jesse James’ son. Still a boy, he sold lemon drops to actors at the Gillis theatre in Kansas City. Amused by his already booming, deep voice, various actors urged him to cultivate it and go on the stage, which he did at the youthful age of 16. Apparently, Beery was possessed of a rich singing voice, and after some lessons, performed as a singer for a year in the Kansas City area and for a week at the fashionable Hammerstein’s Resort in New York state as well as at Kansas City’s Electric Park. Finding he preferred melodrama, he worked under the noted William Brady, scoring a moderate success in a three year tour of a “Trail of the Lonesome Pine” production with brother Wallace. By age 23, he was touring for a year (1905-1906) with Brady’s “As Ye Sow”, eventually playing for a month on Broadway. In 1910 Beery married Marguerite Walker Lindsey, a stage actress. They had a son who died. 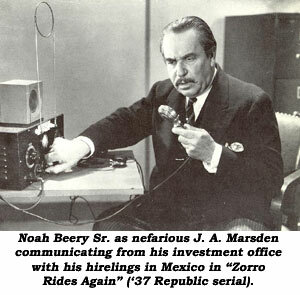 The second child, Noah Lindsey Beery (later called simply Noah Beery Jr.) was born August 10, 1913, in New York. Seriously ill for months, doctors advised a milder climate so the Beerys moved to Florida where Noah Sr. made some early films and worked at any job he could find until the family finally reached California in 1917 where he found film work immediately, eventually appearing in over 110 silents. 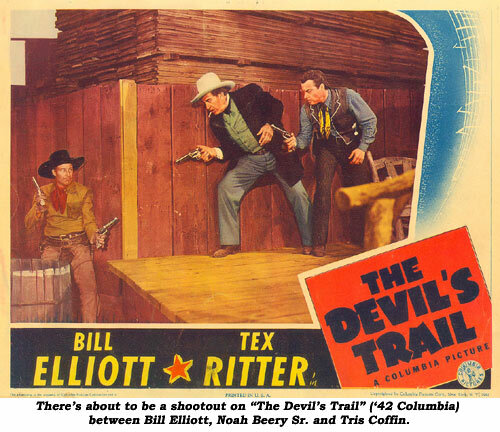 Of his silents, 22 were westerns, including many Zane Grey epics with either Jack Holt or Richard Dix. But he’s also in the classic “Mark of Zorro” (‘20) with Douglas Fairbanks Sr. and the 1923 version of “The Spoilers”. Probably his finest roles were as the sadistic sergeant major of “Beau Geste” (‘26) and as the guard who beat and tortured little children of a reformatory in “The Godless Girl” (‘29–last two scenes have dialog added). Achieving success, the Beerys bought a ranch in the San Fernando Valley on which they grew tobacco. There were also grapevines, avocado, orange and lemon trees. His chief avocation was his famous Paradise Trout Club, located 100 miles from L.A., a popular year-round rendezvous for sports. As talkies came in, Beery was in his late 40s, and even with his powerful voice and fabulous persona, his star began to slip—although he worked in nearly 90 films on through 1945. Beery’s wife died in 1935 but 1940 saw his son Noah Jr. join with another respected Hollywood family when he married Maxine Jones, daughter of Buck Jones. 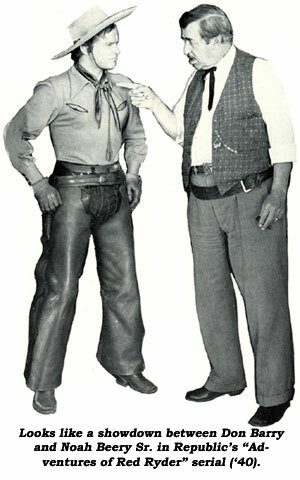 Beery had completed a role in his last film, a western, “Sing Me a Song of Texas” (‘45 Columbia) with Tom Tyler, and in 1946 was residing in a New York City hotel while playing the role of Tammany Hall’s Boss Tweed in a stage production of “Up In Central Park”. He was taking a two-week vacation from the play to visit California where he, his brother Wallace, and Wallace’s daughter, Carol Ann, were to appear together on a Lux Radio Theatre presentation. On April 1, 1946, while running their lines at Wallace’s home on Colgate Avenue in L.A. during the afternoon of their scheduled evening performance, Noah suffered a fatal heart attack and died in his brother’s arms. True to the show-biz adage, the show went on that evening—minus Noah. He was 64. He is buried at Forest Lawn, Hollywood Hills. 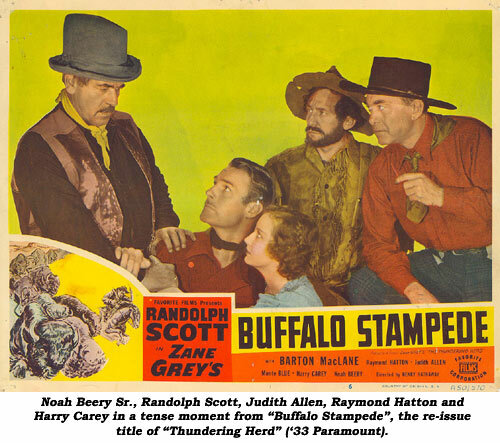 Noah’s lecherous, sadistic, coarse and uncouth roles set a standard for heavies to come in such westerns as “Riders of the Purple Sage” w/George O’Brien; “Big Stampede” w/John Wayne; “Thundering Herd”, “Man of the Forest”, “To the Last Man”, “Sunset Pass”, all Zane Grey Paramounts w/Randolph Scott; “Mexicali Rose” w/Gene Autry; “Tulsa Kid”, “A Missouri Outlaw”, “Outlaws of Pine Ridge”, “Carson City Cyclone”, all with Don Barry, and “Devil’s Trail” w/Bill Elliott/Tex Ritter. Beery also displayed his nastiness in five classic serials: “Devil Horse”, “Fighting With Kit Carson”, “Zorro Rides Again”, “Adventures of Red Ryder” and “Overland Mail”.